Spend a night in a snow hotel. Admire the Northern Lights together. 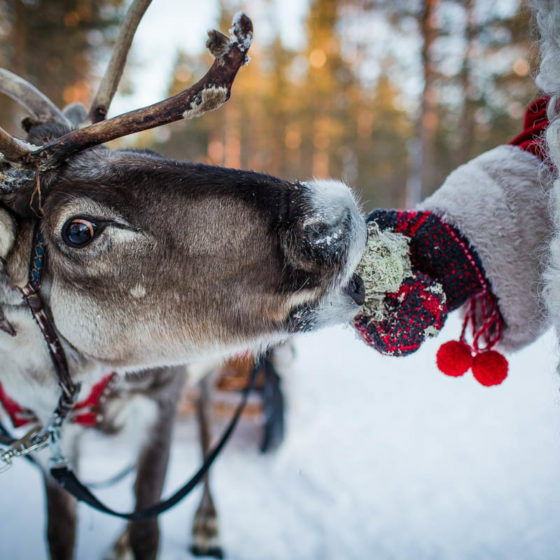 Have fun on a reindeer sleigh ride. 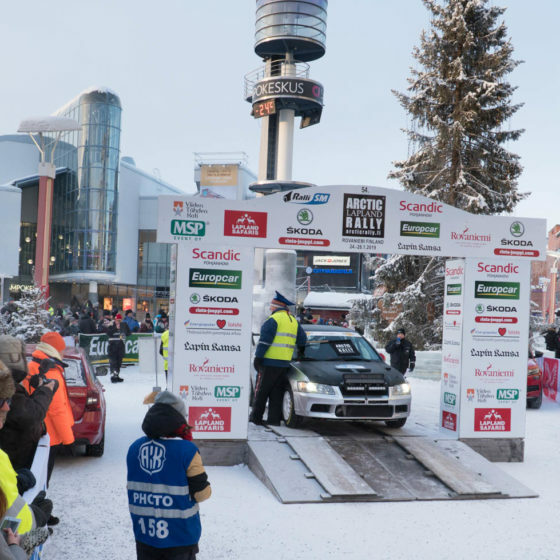 Good times together in Rovaniemi. Have drinks at an ice bar. 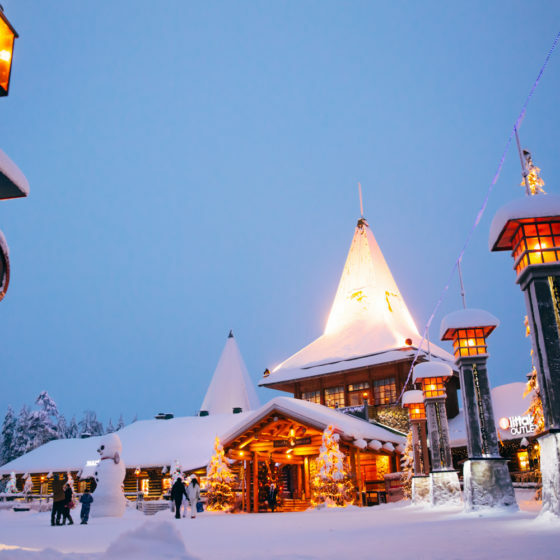 What could be more romantic than making a once-in-a-lifetime trip in the coolest destination in the world: Lapland’s winter wonderland! 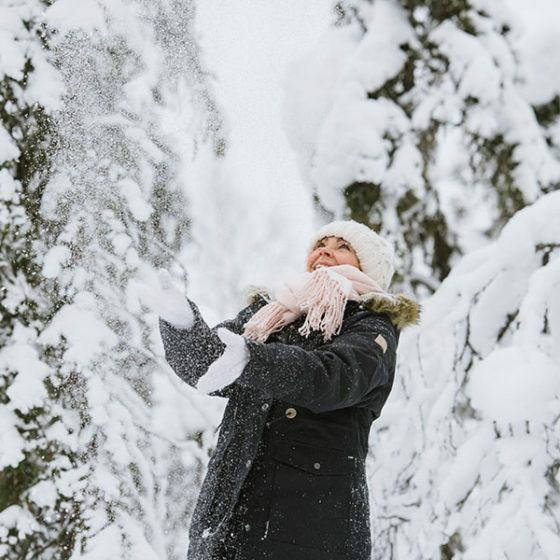 From a romantic weekend to an unforgettable honeymoon, you can choose to spend time cozying up by the fire, enjoy the spectacular arctic environment, or take your pick from the unique activities available in Rovaniemi. 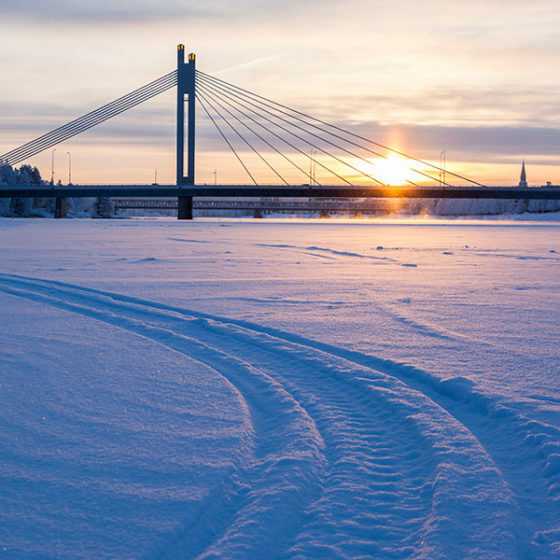 If you want to take that special someone somewhere special, Rovaniemi has plenty of accommodation options that will take your breath away. Spend the night staring up at the stars in a glass igloo – a private cabin with a glass roof open to the sky. Maybe you’ll be lucky and catch the aurora dancing above your bed. See Arctic SnowHotel and Glass Igloos and Santa’s Igloos Arctic Circle. Snuggle up together in the beautifully sculpted rooms of a fairy tale snow hotel in Arctic SnowHotel. It’s a surprisingly warm way to chill. 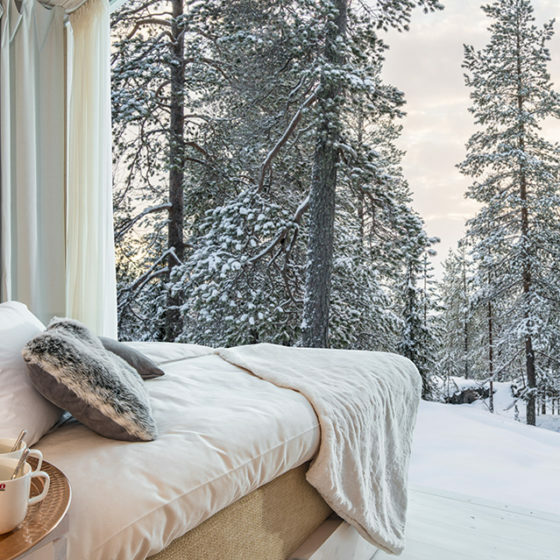 See the snowy landscape from a different perspective – from a private panoramic love nest high up in the trees at the Arctic TreeHouse Hotel. For the most luxurious trip, check out the Arctic Light Hotel. 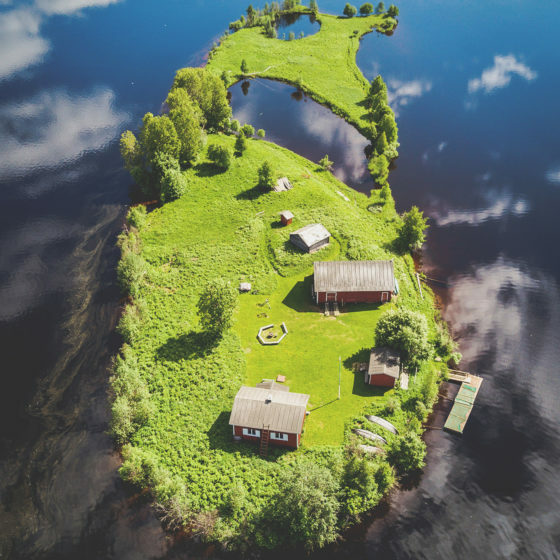 Lapland’s first boutique hotel pulls out all the stops, easily earning its reputation as the best hotel in Finland (as rated on TripAdvisor and Trivago). For the ultimate in privacy, get away from everything in a cozy wilderness cabin. 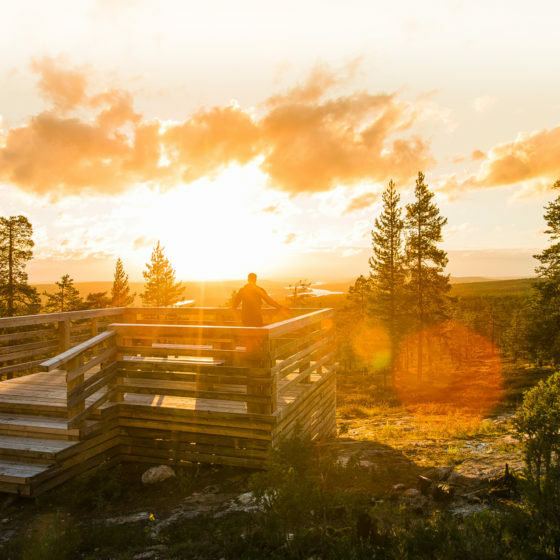 Located far from the crowds, you’ll be able to enjoy the silence and solitude of a true Lapland experience. 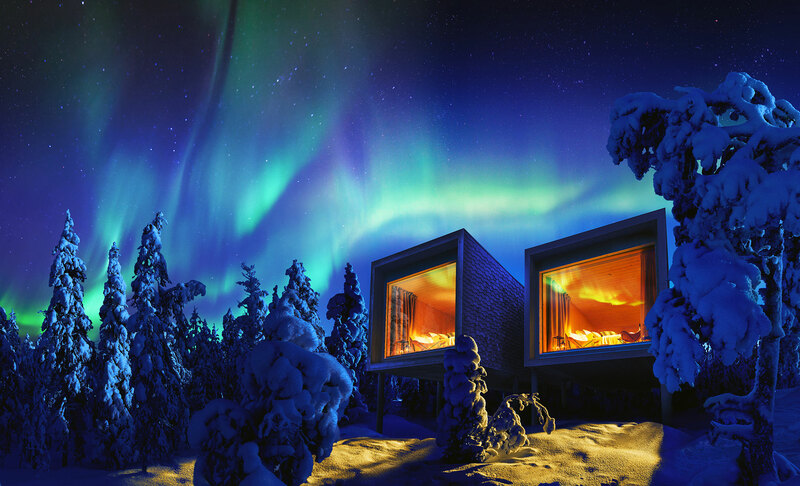 Arctic TreeHouse Hotel under the Northern Lights. 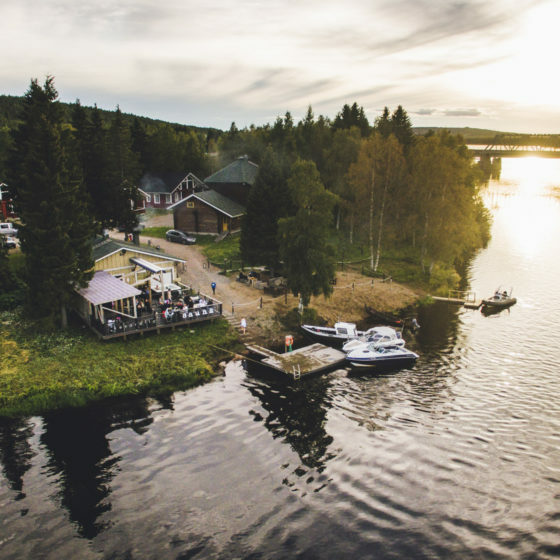 Rovaniemi’s many restaurants range from local delicacies to international cuisine – here are a few of our top picks for the perfect romantic meal. Bon appétit! 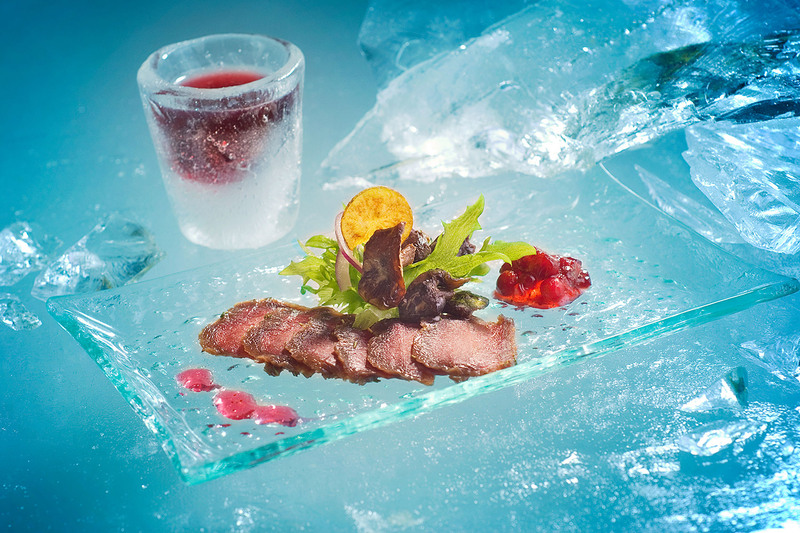 In Rakas Restaurant – the restaurant named after Finnish word for “love” – a romantic evening is almost guaranteed. 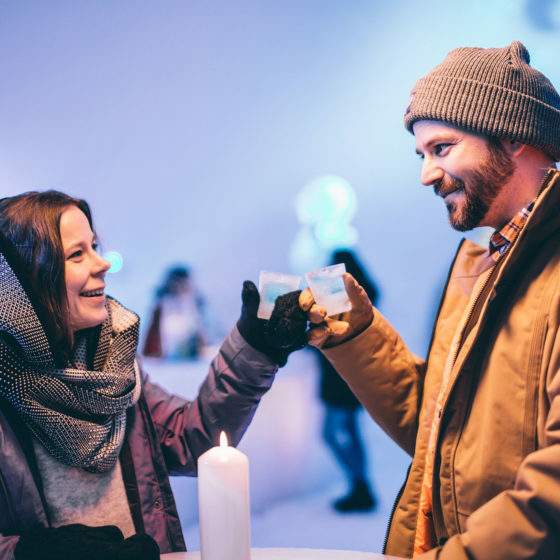 For a truly unique experience, seek out one of the snow restaurants and bars, where you’ll dine on chairs and tables carved from ice and snow. 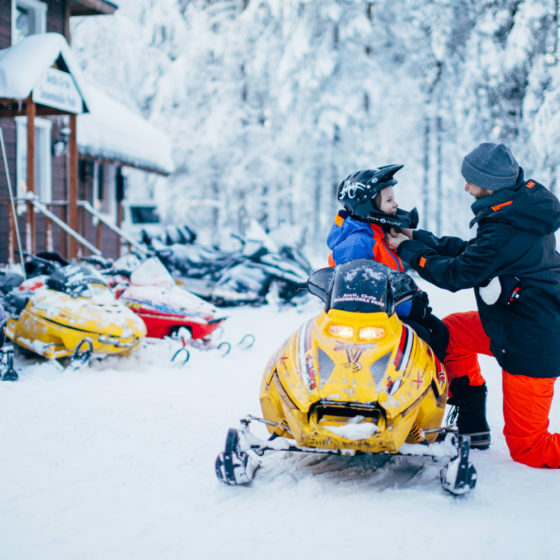 For an authentic taste of Lapland, Restaurant Nili offers locally-sourced ingredients in an atmospheric setting with friendly service. 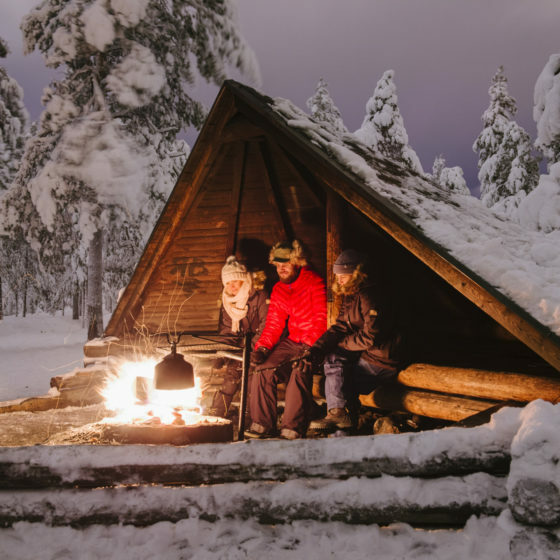 The food in Lapland never tastes better then when it’s eaten in the wild, so why not enjoy a guided trip to a wilderness fireplace, or eat in a kota (a Samí tipi). 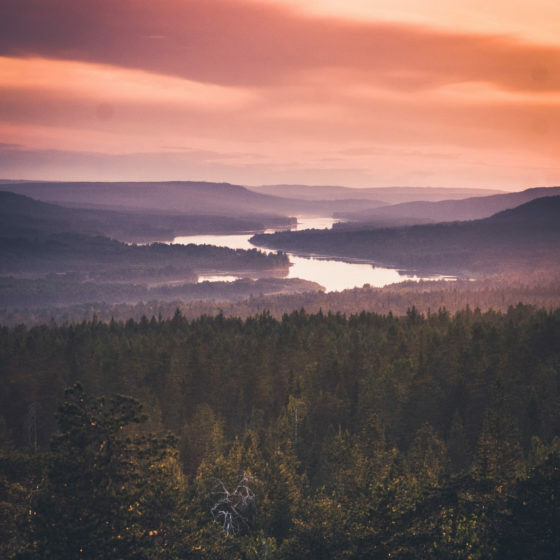 High above Rovaniemi on top of Ounasvaara fell, you’ll find Lapland Hotel Sky Ounasvaara, one of the best restaurants in Finland, offering fine dining – and some surprise delicacies. 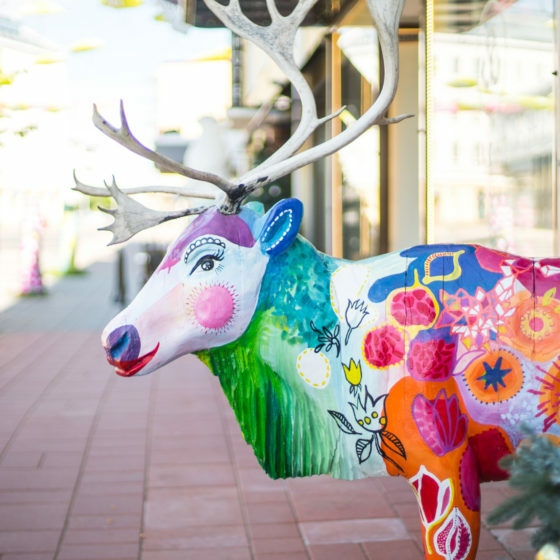 Rovaniemi’s award-winning chocolatiers at ChocoDeli offer a selection of heart-shaped nibbles with unusual flavours. One is never enough. Dinner in a snow restaurant. 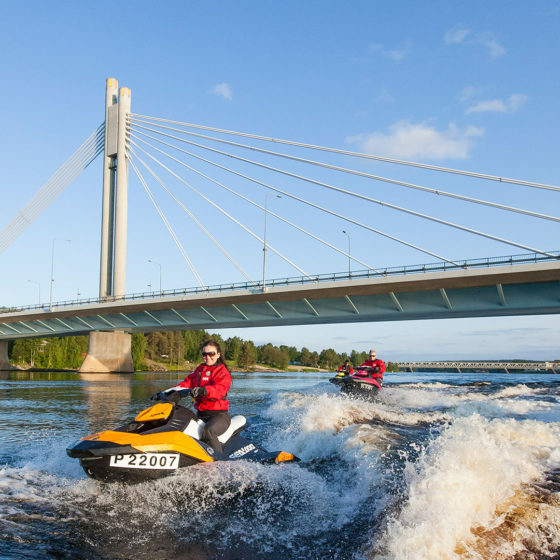 Any activity in Rovaniemi is bound to put a smile on your face. 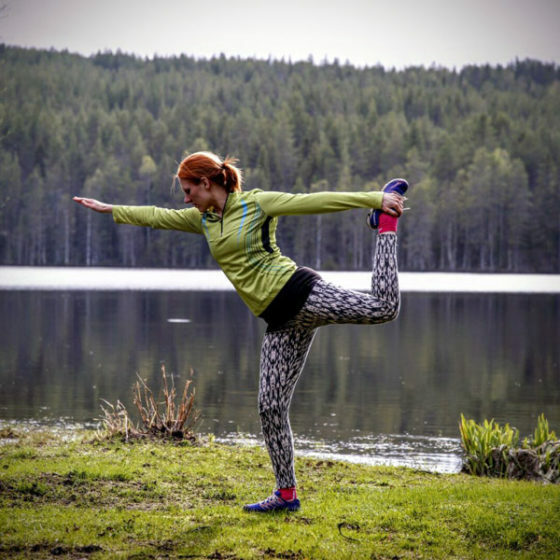 There’s so much to choose from, so here are some of our favourite, heartwarming activities. Share a kiss across the Arctic Circle. 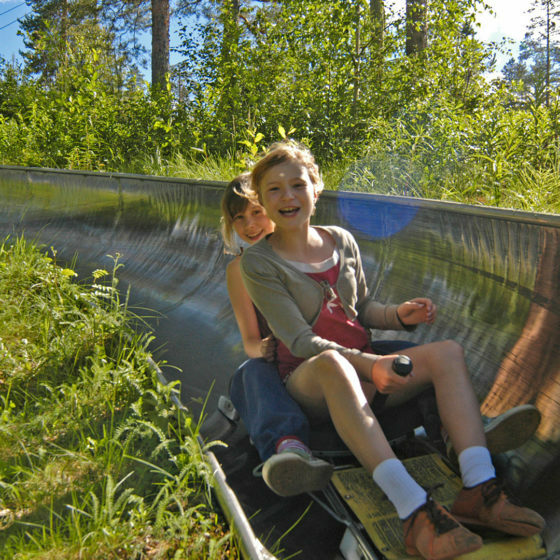 Take a trip to Santa Claus Village and you’ll find the Arctic Circle line. Stand on either side and share your love around the world. 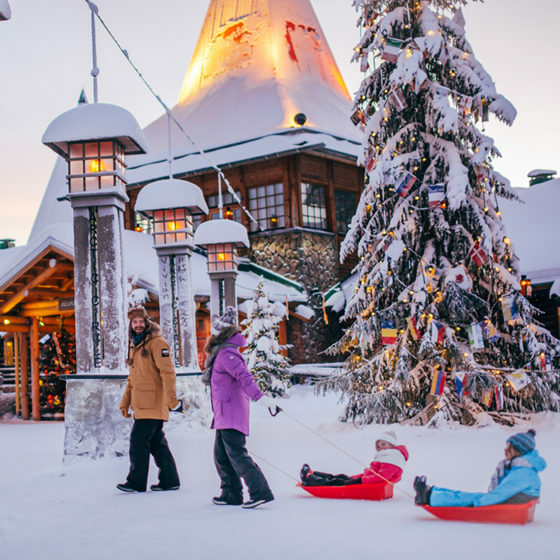 While you’re at Santa Claus Village, why not pay a visit to the old man himself, and take a photo with Santa to capture the memory. 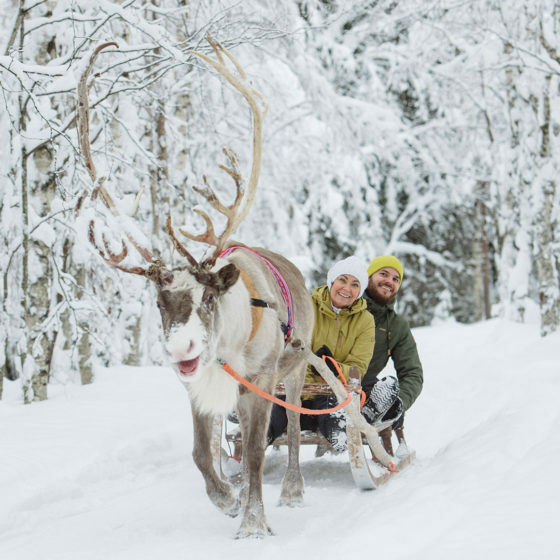 Can there be anything more romantic than a reindeer-driven sleigh ride through the forest with your loved one? Feel the wind in your hair on a high-speed husky ride, or go play with the pups on a small husky farm. 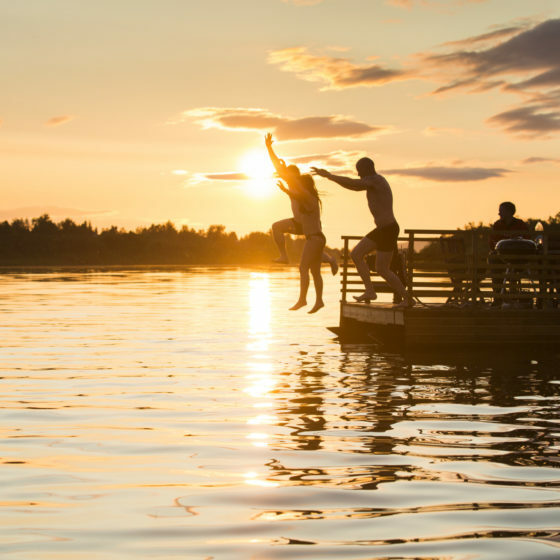 For the hard-core romantic, how about ice floating hand-in-hand in the icy water of a river or lake? 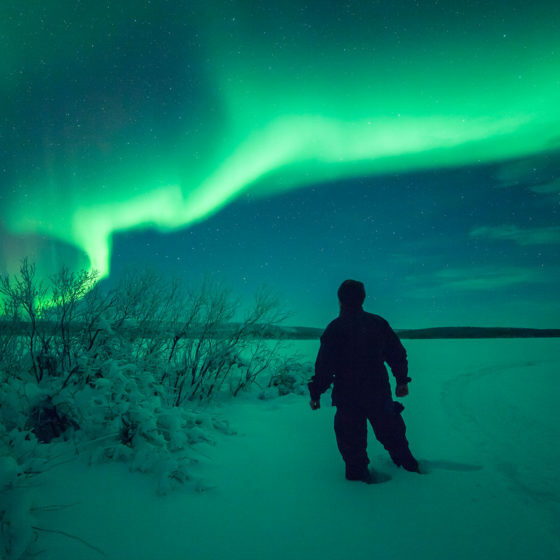 Safely wrapped in your warm dry suits, if you’re lucky you may just catch a glimpse of the northern lights. 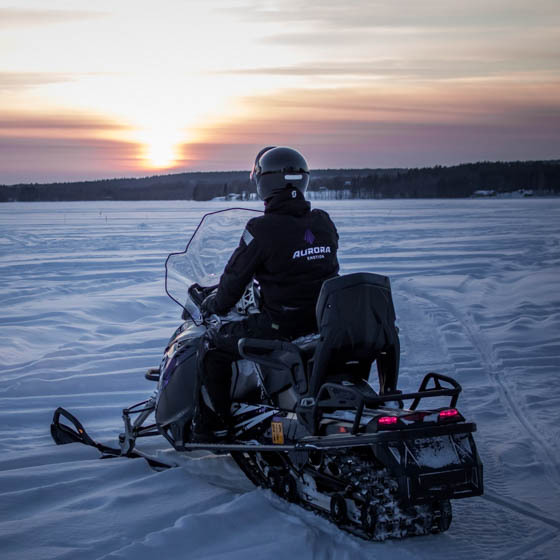 There are so many magical spots in Rovaniemi, but the easiest way to get to the most breathtaking scenery is by snowmobile. Ask for a private safari or guided trip to a secluded romantic hilltop, and bask in the beauty of nature. Show your true love for each other with a professional selfie taken under the awe-inspiring Aurora Borealis. 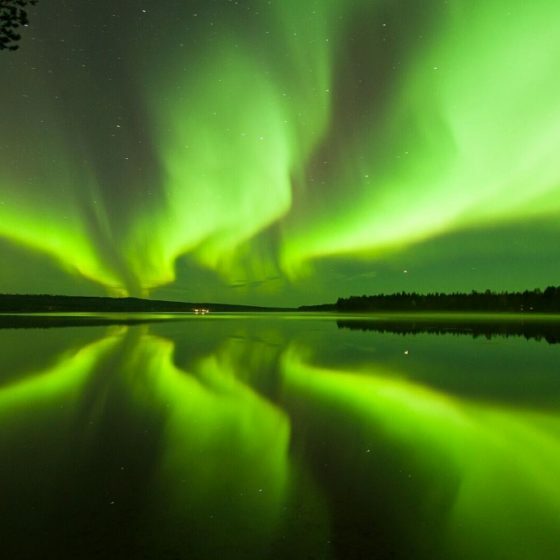 Want to get closer to the Northern Lights? Take an aurora-spotting flight in a small plane to get up close and personal! Go on a romantic moonlit snowshoe walk through the frozen, silent forest. It’s an unforgettable experience. For something truly unusual, try a cruise on an icebreaker. Feel the power of the ships as they clear a path through the sea ice. 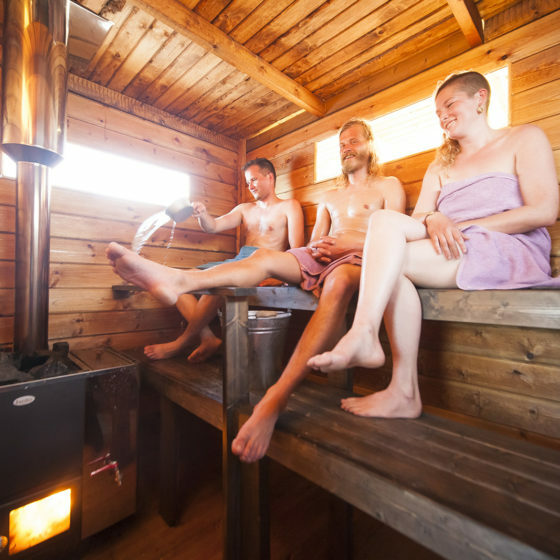 Dare to go ice swimming, then hurry inside to the soothing warm embrace of a cozy sauna. Afterwards, enjoy a candlelit dinner by the warmth of a fire. Ice floating under the starry sky and the Northern Lights. 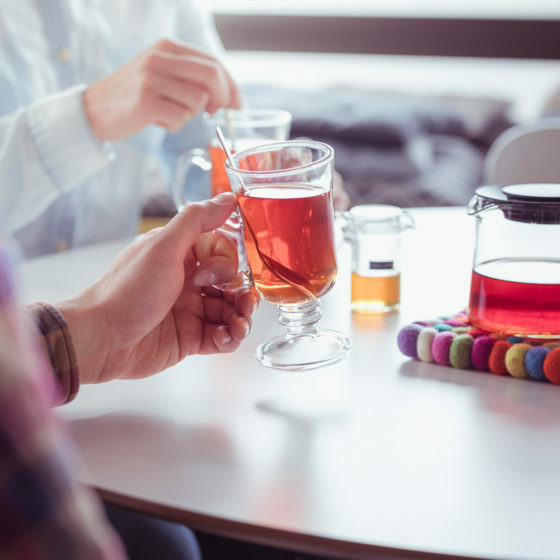 We all know that it’s the smaller moments that help make a trip truly romantic – those little moments when you take some time for yourself are when the magic happens. 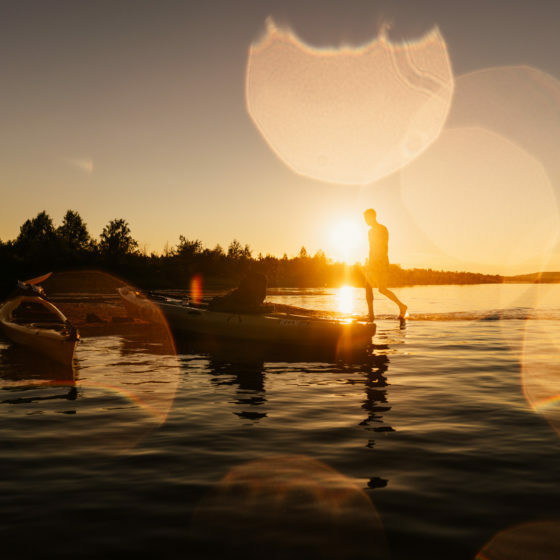 Stroll hand-in-hand down a frozen river in the golden light of a Lapland sunset. 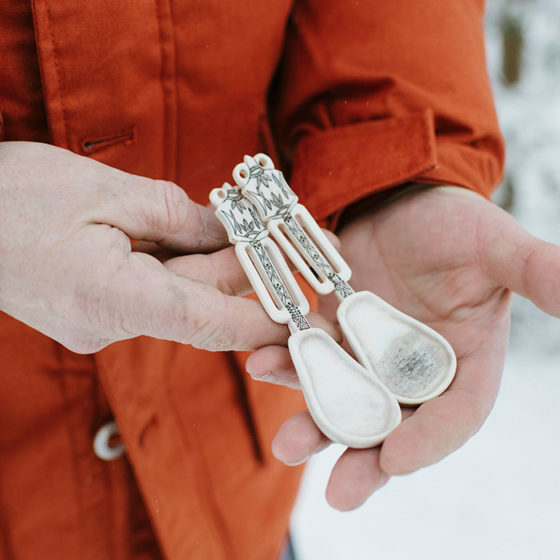 Select a hand-made traditional Lapland kuksa (wooden cup) for each other with your names and the date of your trip etched into them. Or find a unique souvenir to remind you of your trip. 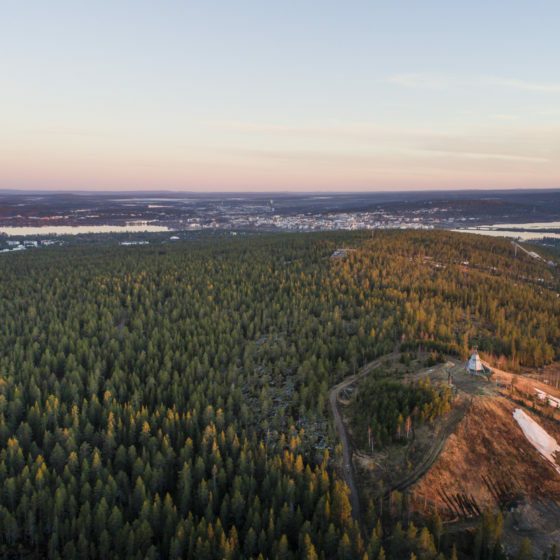 Take a walk along the Ounasvaara nature trail and climb the viewing tower to find a romantic bird’s eye view over the glittering lights of Rovaniemi city. 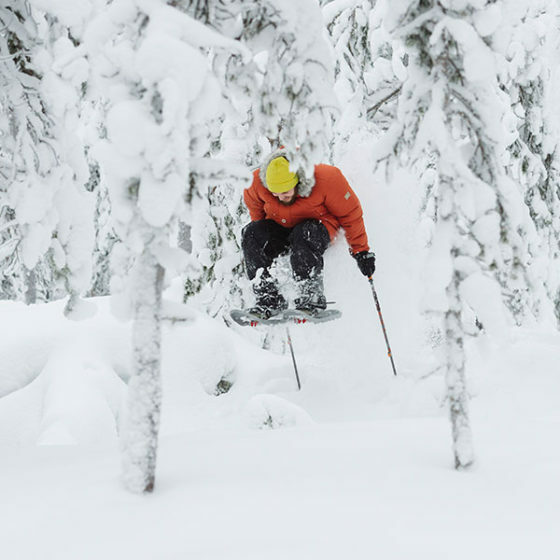 There’s plenty of fun to be had on two skis, and whether you prefer cross country or downhill, the courses and trails at Ounasvaara Ski Resort will get you up to speed in no time. 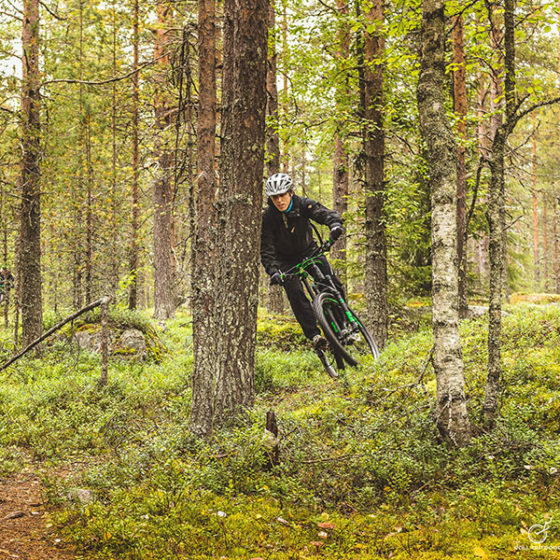 If you prefer two wheels, the latest craze of winter fatbiking will put a big, bouncy smile on your faces. Fatbiking in a snowy forest.